We have completed the construction of our contrast testing facility, and I will be posting an article focused on contrast specifications in the next couple of days. Meanwhile, we have received two new 1080p projectors, and reviews of both of them are underway. These are the Infocus Play Big IN83, and the Viewsonic Pro8100. Right behind them is the Optoma HD65. How about screens? In addition to the ongoing projector reviews, we've added screens to our agenda for this spring. People keep asking for recommendations on inexpensive but good quality screens, so we are requesting samples of 100" fixed frame screens that sell for under $500 from a variety of vendors. After we've had a chance to light them up, we'll report back on the best screens and the best values. We've just started this project, so I'm thinking it will be done in the last part of April. Photography, anyone? How interested are you in the best projectors to select specifically for the display of photography? If you'd like to see an article written on this topic, click here to drop me an email. I'd like to know how you'd plan to use a projector for photography. That would help us define the scope of the article. The review of the BenQ W5000 has just been posted. Wow, if you want a sharp 1080p picture this one has got it. It isn't without a flaw or two, but what projector isn't? Overall, an outstanding product from BenQ! You may notice that I am experimenting with the review format. In this review of the BenQ W5000 I have highlighted the key advantages and limitations in more of a bullet item format for what I hope will be easier reference. The objective is to draw quicker attention to important advantages of the product, as well as noteworthy weaknesses. Anything that doesn't stand out as either a unique benefit or a problem doesn't get mentioned. In this way we hope to cut the length of the review a bit, and make it easier to scan and absorb. Your comments on this approach would be welcome. If you wish, click the Contact Us link at the bottom of this page to send me your thoughts. On a related subject, we are rarely asked about including screen shots in reviews, so I get the feeling you don't need or want them. We have never done screen shots because, in my view, they are misleading--they make every projected image look like plasma TV. Furthermore, subtle differences in contrast and color saturation get obliterated when captured on digital cameras. On the other hand, though they are often misleading, screen shots can add visual glitz and glamour to the review text. In this way they might lend the product being reviewed more excitement and appeal. I would like to hear your opinion on this ... do you as a regular reader of this site wish we would include screen shots in our reviews? Again, if you have an opinion one way or the other, feel free to click the link below and let me know. The next home theater projector review will be the Sony VPL-VW40, which we plan to post Friday. The BenQ W20000 will follow next week. We posted our latest review of the Canon REALis SX7 yesterday afternoon. I love this projector because it does a great job of lighting up my 150" 4:3 Stewart Studiotek 130 screen. For viewing old classic films, which are a particular interest of mine, this is the way to see them. Most people will want the SX7 for high resolution display of graphics and so on, but I really enjoy it as a movie projector. We now have several new home theater projectors in house, and in various stages of review. These include the Sony VPL-VW40, the BenQ W5000, and the BenQ W20000. We got into the BenQ W5000 first, so that will probably be the next review to post, but we will try to get all of them done in the next two weeks or so. 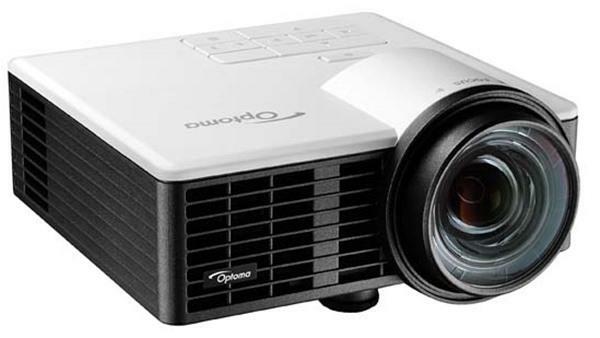 If you are interested in rock bottom prices for 1080p projectors, take note that the Sanyo Z2000 now has $600 worth of rebates against the official price of $2,495, which brings the maximum price you will pay for this gem down to a remarkable $1,895. The rebate is scheduled to end on March 31, but it adds to the already impressive price/performance of the Z2000, making it one of the most competitive 1080p models on the market at this moment. If you are a traveling presenter who wants a lot of light from a tiny package, the new review of the InFocus IN10 will be of particular interest. It is hard to believe you can get this much light out of a 2.4 lb. projector, but InFocus has done it in a product we're proud to list has Highly Rated. We are just finishing up a review of the Canon Realis SX7, which is Canon's new 4000 lumen SXGA+ model. If you want bright, high resolution 4:3 images, the SX7 review is not to be missed. Several other commentaries are in the works, as well as pending reviews of the Sony VW40 and the new BenQ home theater units. Stay tuned for more new postings in the month of February. Well, we finally got the Epson Pro Cinema 1080 UB review done and posted. Another great achievement by Epson, a company that has definitely increased its focus on producing leading edge home theater projectors. This latest crop of releases from Epson far surpasses anything they've done in the past as far as price/performance is concerned. I want to write up some comments about the CES show in general, and about the latest developments in the HD DVD vs. Blu-ray tussle in particular. (As many of you probably already know, Warner Bros. announced exclusive support for Blu-ray two days before the opening of CES--a move that caught everyone, including the HD DVD consortium, completely by surprise.) But I am waiting on more information to come in, so this will be on the agenda for next week. This has been a very busy two weeks to start the new year, and I want to thank you all for your patience. Just an update for everyone asking .... I plan to post the Epson Cinema 1080 UB review on Friday morning. Thanks for your patience. Well, welcome to 2008! We hope you all survived the holidays. I came down with an unexpected bug that had me out of commission for a while. However, I'm back in the saddle and ready for the CES convention that starts Monday here in Las Vegas. I was hoping we'd get the Epson Cinema 1080 UB and Cinema 720 reviews done by today, and I know you were too. But due to a combination of illness, vacation, and just simply too much side by side testing to do, we are not making the schedule. And to complicate things, CES constitutes a huge distraction for us next week. We've got a lot of meetings with vendors lined up to hear what they have planned for 2008. Therefore, I will give you some brief thoughts on the Epson products here, and save the details for the final reviews. First, Epson has clearly taken their home theater projectors to a new level. Not only are the Pro Cinema 1080 UB and Home Cinema 720 projectors large steps ahead of their previous models, but they are without a doubt the most competitive home theater projectors we've ever seen from Epson. With these models, Epson enters the top ranks in overall home theater industry price/performance - in our opinion for the first time. The Cinema Pro 1080 UB has excellent black level, contrast, and color saturation for the money. It is appropriately priced above the Panasonic AE2000, for its image quality in terms of these key parameters is a clear notch above the AE2000 as well. Conversely, the 1080 UB is priced well under the JVC RS2, and this is also as it should be. The RS2 is the superior projector in terms of black levels, contrast, and saturation. For the premium dollar you spend on the RS2, you get visibly better performance. So as we've seen before, you can safely discard the official contrast ratings (50,000:1 on the 1080 UB vs. 30,000:1 on the RS2) as reliable guides to relative contrast performance. We have not yet had the opportunity to do side by side testing between the Epson 1080 UB and the JVC RS1. This will be an important section in the review since these two models are more closely matched in price and performance. The fact is, you can get either one of them and end up with a magnificent home theater set up. As far as the Epson Cinema 720 is concerned, this is a beautiful 720p resolution product that represents a significant improvement over the Cinema 400 in contrast, saturation, and color accuracy. Bill will have more to say about this in the review, but the Cinema 720 is highly competitive at its current street price level. Epson fans can order this one today without any fear of not getting top performance for the dollar spent.